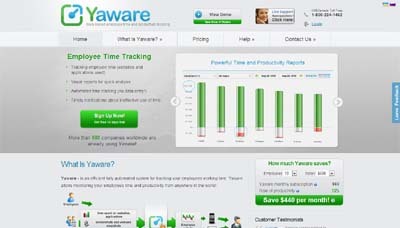 Yaware is the most effective employee time tracking software you will ever use. It’s an automated, simple and convenient tool for tracking the working time of the whole team. Wherever your employees work, all the data about their working time and productivity is in your account. Yaware provides you with powerful business intelligence and helps your team get more productive! Yaware application sits in the background and records the information about programs, websites, applications being used. A user can open multiple tabs in a browser, but Yaware will record the time in one that is actively used at that moment. Employees can use a variety of resources (websites, software, applications) during the working day. Account or group manager specifies productivity category according to employee’s tasks. Thus productive time means using tools related to work, unproductive time means using distracting applications and websites at work and neutral is something in between. Yaware allows you to organize users in groups – by departments ( e.g. marketing department, accounts department and so on. ), project teams etc. This is convenient because employees in different department use different resourses for their work. For example, time spent in Photoshop is productive for a designer and unproductive for an accountant. Yaware allows to set different resourse productivity status for different groups. Besides a Group may have its monitoring schedule as well as a Manager who monitors the work of his group and productivity changes. Yaware presents the information in graphs for quick analysis. With Yaware it takes only several minutes a day to analyze working time and productivity of your team. Taking a look at the diagram you can determine the most productive employees, see who was late for work, compare employees’ productivity within different time periods; determine most distracting websites and applications. If you don’t want your employees to know about the monitoring you can install Yaware in Hidden mode. In that case Yaware icon isn’t displayed in traybar and the software can be detected only in Task manager window. Though we believe that using Yaware in the open is much more productive as it allows to involve employees in time-management process. Usually specialists have to solve tasks that do not require computer use. Yaware offers offline activity tracking feature that helps to get a general view of how time is used in your company. This tool helps to track time spent on non-computer work – meetings, phone calls as well as non-working activities. When user’s computer goes idle for some period of time, a message pops up offering to specify the type of activity (You can add whatever options you need). You can optionally make screenshots and webcam snapshots and store them in your Yaware account. These features allow to control the work of freelancers, branch-offices and employees working flexi-hours. On the other hand screenshots and webcam snapshots help to prevent possible malusage of time in your office.